Schloss Laxenburg is a vast complex holding a park and several buildings.The castle park is one of the most beautiful English-style gardens in Europe of 280 hectare. Schloss Laxenburg mainly refers to the “Franzensburg”, the main building in the park that is open to the public. It was build by the Habsburger emperor of Austria Franz II and his grandmother Maria Theresia and was completed in 1835. The replica of a medieval knights castle was never ment to be inhibitad. Instead Emperor Franz II build it to celebrate the history of the house of Habsburg, bringing together all kinds of items from other castles and monastaries thoughout the country. 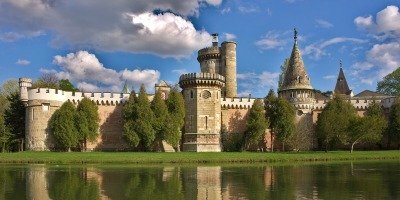 The result is a fairytale castle with numerous different treasures from around Austria on an artificial island in the lake. Even though no one ever lived there, it Is an interesting place to visit. You can find all kinds of statues, paintings, furniture and pieces of architecture from various periods of the house of Habsburg histiory. Around the castle grounds are several other buildings, grottos, temples and a medieval tournament site. The first castle that was build in this area was the Old Castle, build by the Herren von Lachsenburg. In the 14th Century this family went extinct and the castle became property of the Habsbrg family who made the place to a hunting lodge. In 1683 the Turks laid a siege on Vienna and destroid everything around the city, including this Castle. Today only the old core of the castle can be seen, and the reconstructions and enlargements that were made later. The castle is not open to the public. 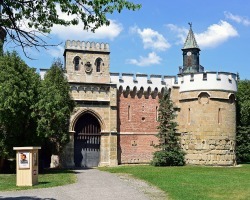 The chapel of he the castle dating from the 13th Century, is still being used for concerts, weddings and other festivities. The second building was the "Blauer Hof" (Blue Court), build in the 15th century. 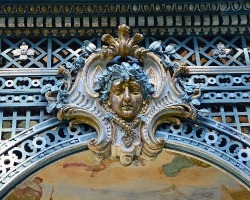 This lovely baroque palace was a favourite summer residence of the house of Habsburg monarchs. Here emperor Franz Josef and his new wife Empress Sisi spend their honymoon. It should have been romantic, but the emperor of Austria had to rush to the Hofburg in Vienna every day, since a diplomatic crisis demanded his precence in Vienna. This ment that Sisi spend her honymoon practically alone, a fiftheen year old girl, surrounded by a crowd of courtiers she did not know and hovered by her mother in law. The only fun she had was horseriding through the Laxenburg woods all day, much to the disaproval of Archduchess Sophie. The emperial family continued to have their annual spring break at the Blue Court. Both Gisela and crown prince Rudoplf were born here. Crown Prince Rudolf and his wife Princess Stephanie also had their honemoon here, probably just as romatic as the one his parent’s had, since this was a arranged marriage. 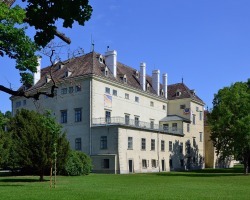 The daughter and only child of Rudolf and Stephanie, Archduchess Elisabeth, was also born at Laxenburg Castle. During the conflicts with Italy and Prussia Elisabeth used parts of the building as a hospital for wounded soldiers. The former palace theatre and imperial dining rooms nowadays are used as a conference center. 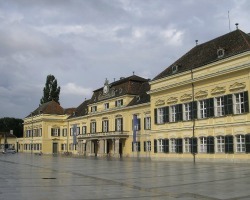 The Blauer hof also houses the headquarters of the International Institute for Applied Systems Analysis. 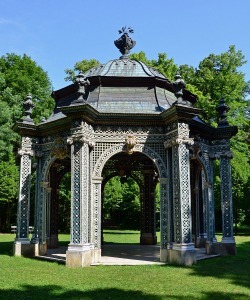 Today the approximately 250 ha large castle park is a popular destinations for Vienna's city population. They come hiking and take romatic boattrips on the 25-hectare castle pond. On the Island in this lake the Frenzenburg was build. The park is was designed a English-style garden and holds many historical buildings. A train takes you through the gardens, but you can af course also take a walk.